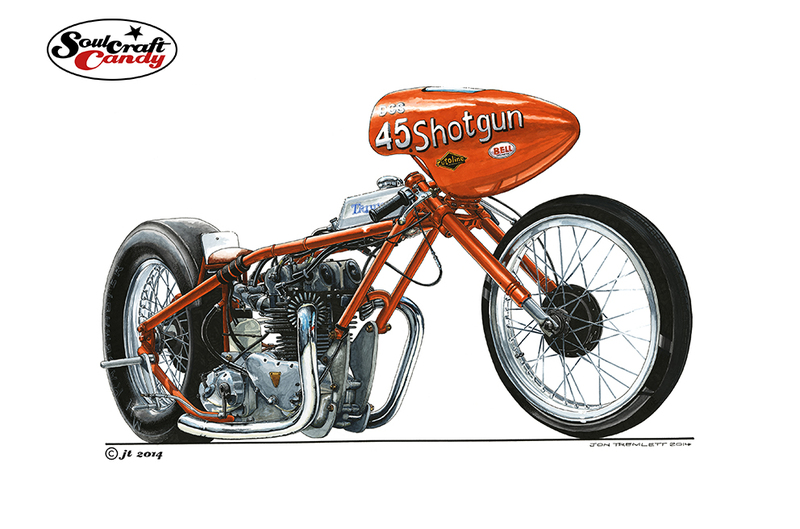 Shotgun drag bike – the finished picture. Now that the finished picture is finally with its new owner, it’s the right time to post it here on the blog. It would have been unfair on Nik to put the finished picture up before he’d had a chance to see it in the flesh. Needless to say he had a very big smile on his face when he unwrapped the parcel, a moment that gave me great satisfaction and a fitting end to a project that has been utterly enjoyable to do, and has left me feeling that this could very well be the best picture I’ve done to date. So brilliant to get something just right. I think he’s going to hang it in his living room which makes me very proud and is rather flattering to be honest. The front fairing was, in time honoured tradition, pretty much the trickiest part to complete in colour. As I hinted in the previous post, these intense liquid colours come with their own set of particular limitations, namely their ability to “blend” across larger areas and around complex details. Getting the red to “flow” around all of the lettering involved lots of quick brush work, letting things dry and using very diluted tints laid over each other. It took quite some time, but the result looks great in the context of the overall picture. We’d agreed that the bike would sit alone on the background and so the finishing touch was just to put the thick black line under the wheels and sign it. Job done. Nik had also asked me to do him a smaller black and white drawing that he could use for t-shirts and cards. I chose a simple elevational view for this one, and the dot shading technique I’ve used on a couple of previous pictures seemed the best way to go. As I’ve said before, this is a rather time consuming way to apply shade to a drawing but it does give the finished thing a look which is very distinct and crisp. With these two done it’s time to delve into the unfinished projects drawer and pull out a couple of sketches that have been on the back burner for some time now. There’s also the possibility that I’ll do another picture of the Shotgun, perhaps a partial drawing from another angle. I’m undecided at present but will post up how I get on with both of these options soon. 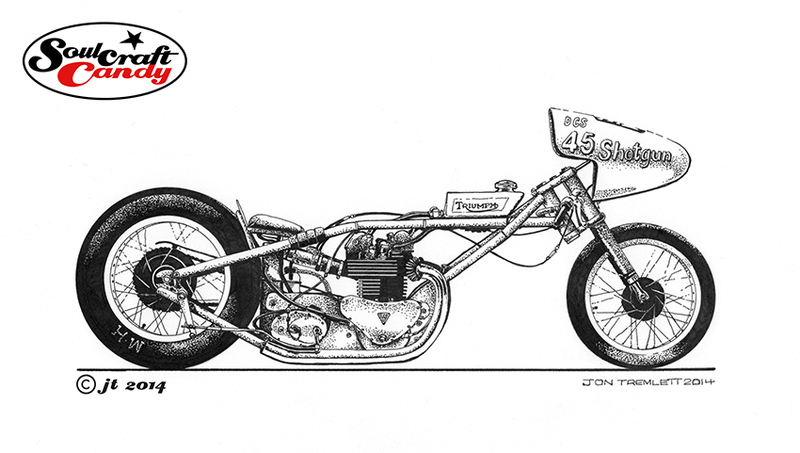 This entry was posted in Bike drawing, Cartoon, Colour, Commissions, Drag bike, Drawing, Getting you eye in, Ink, Motorcycle Art, Motorcycle drawings, Shading, Watercolour and tagged Bike drawings, Color washes, Commissions, Dragsters, illustration, Motorcycle Art, Motorcycle drawings, watercolour by Soulcraftcandyman. Bookmark the permalink.